How Does the Disney Snapbot Work? The Snapbot is the newest robotics development released by the Disney Research team. 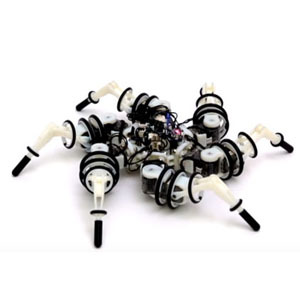 With a main body and six detachable legs, the spider-like form is modular and can be reconfigured in many different ways for different types of mobility. The Snapbot was developed with a focus on its ability to be reconfigurable while still maintaining mobility. Whether there’s only one leg attached, or whether the full six legs are attached, the robot is still able to travel. While there has previously been much research devoted to variable configurations of legged robots (monopod, biped, quadruped, hexapod, etc. ), most of these robots have a model-based setting. So, you would set the robot into a three-legged scheme, attach three legs, and then watch the robot go. With the Snapbot, the embedded algorithm “reads” the robot’s configuration and adjusts its movement patterns accordingly. This means that after an “injury” such as losing one of its legs, it can adapt its behavior. The hardware of the snapbot consists of a 3D printed body and six legs. The main body is the central hub of the robot. 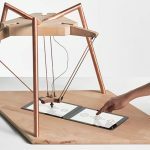 It’s shaped like a hexagon with the six sides providing the interface for the six legs, and it has six triangular supports on the bottom that minimize the bot’s friction with the ground surface. 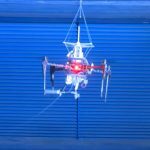 It’s outfitted with a 7.2V lithium-ion battery that provides the machine’s untethered power supply. And it also has an OpenCM9.04 microcontroller that provides the processing power for the machine. The microcontroller is attached to the body frame with four rivets, and the data from the microcontroller is directed into two hubs, each of which then transmits to the three nearest legs. The total width of the body is just shy of three inches, and its weight, including the battery and electronics, is about 0.4 pounds. Each modular leg is then attached to the main body in a radial formation, unlike the Anthrobot, which has its six legs structured in two sets of three legs on each side of the main body. Up to six legs can be attached to the Snapbot, but there were three types of legs designed to provide three different types of movement. The three leg types are a roll-pitch, a yaw-pitch, and a roll-yaw pitch. Each leg is 3D printed as a single articulating part which cannot be disassembled, and each uses a Dynamixel XL-320 position-controlled servos. There is a rubber tip added to the foot to help the leg endure the stresses and impacts of locomotion. This leg design focused on keeping the parts lightweight while still allowing for a degree of structural integrity. Each leg weighs 0.19 to 0.026 pounds, depending on the type of leg. Like other nature-inspired robots, the Snapbot was inspired by animals, which the researches closely studied. In particular, they looked at those which have the ability to change their configuration based on their circumstances. More than just changing positioning like a person moving from a sitting to standing position, animals like the starfish are able to voluntarily separate from a limb to escape a predator, and then can regenerate the limb later. The research paper also cites insects for their ability to still walk even after having lost one or more of their six legs. It also cites the metamorphosis that frogs go through — growing two pairs of legs and losing a tail. In designing the bot, researchers also looked to other modular robot systems that have smaller building block parts and uniform couplings. 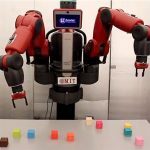 Additionally, researchers studied how machine learning techniques have been used to create robots that can adapt to changing environments or changing configurations. The mechanics of detaching and reattaching the robot’s legs is done through magnetics. A total of four magnets comprise the coupling of each of the robot’s legs, making it easy to pull the legs off or pop the back legs onto the body. The magnets are also arranged using polarity to restrict attachment to the correct part orientation. But these are not simple magnet joints. At the center of each of the couplings is an 8-pin spring-loaded electrical connector. This connector transmits both electricity to power the leg, and the data to tell the leg what to do. In the Snapbot, the microcontroller that’s housed in the central body of the robot is the genesis for the locomotion algorithm. This microcontroller works in real-time to determine the robot’s configuration of legs; it then determines its path of movement based on the number of legs that are attached. For this iteration, the Snapbot’s movements were limited to traveling straight forward, but still there are many variables for the processor to compute. With only one type of leg there would be 14 combinations of leg configurations, but with three types of legs, there are 700 possible leg configurations. To assess the current configuration of legs, the controller pings the servos on each leg to determine the types of legs that are attached. It determines where each type of leg is located via the connector pin that connects the servos’ data line to the controller. This configuration scanning is done every 100 milliseconds. The processor then calculates the forward kinematics based on the configuration. The three types of leg motions are rowing, crawling, and walking. When there is only a single leg, the robot uses a rowing motion to drag the body. 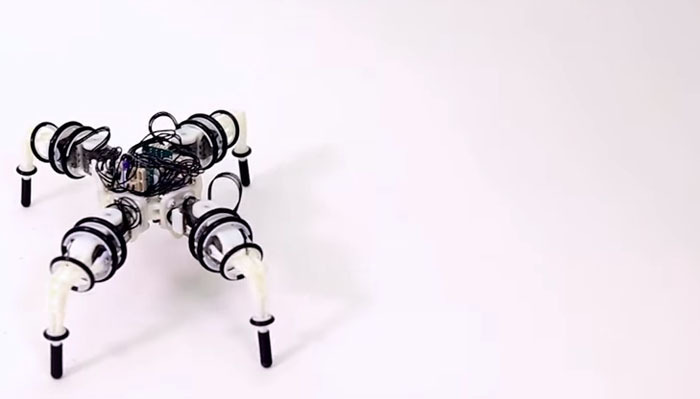 In any variation of two-leg configuration, the robot uses a crawling motion that maximizes the roll-joint movement to create better ground contact with the foot and drag the body. 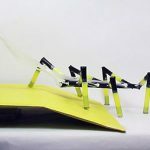 In leg combinations where walking is possible, the Snapbot can elevate its body off the ground and walk forward by using its legs in diagonal pairs. 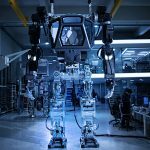 While the Snapbot demonstrates variable configuration models using modular legs and adaptability using real-time machine learning, this robot is a stepping stone in the company’s discovery process. It “will be utilized for further research on legged locomotion,” said Disney Research. 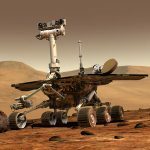 In particular, the team plans to explore how the Snapbot can benefit from evolutionary algorithms and the addition of sensors such as a camera.